The Title of Poet: praise word or description? There has been discussion about what a poet is and whether one can confer the title on oneself. I was tentative for a long time about calling myself a poet. Many say a poet is someone who writes poems. But what makes something a poem? When I was a very young poet (13 or 14), I used to show my work to people and ask’ is this a poem?’ by which I meant ‘does it do what poems are meant to do, is it magic?’That is why I don’t believe in bad poems, if it’s bad, it’s not a poem. William Carlos Williams said ‘if it ain’t a pleasure, it ain’t a poem’. By calling oneself a poet, if one simply means that one writes poems, I don’t have an issue with that. But the secondary definition is that a poet is a ‘person with great imagination and creativity’. I don’t feel I could say that about myself unless other people said it about me first. Matt Simpson always said poet was a ‘praise’ word. There is a tradition behind this assertion. So I used to call myself a writer of poems, or just a writer – which is true enough because I do write other things, such as critique books for Greenwich Exchange, chapters of books aimed at undergraduates, GCSE textbooks. But these are by products of my teaching career. I have written poems since I was very young, but when I read Robert Graves’ The White Goddess’ at 15, I decided to dedicate myself to poetry. I read Auden’s essay ‘The Dyer’s Hand’ too, and from these texts gleaned that I needed to immerse myself in poetry and learn from the masters. I tried every form in Frances Stillman’s Poetry Manual. A poet needs to have the knowledge, to read, to learn from the best, and to keep on doing so. I was almost 19 when I first met Matt Simpson. We gradually moved from mentor/ mentee roles into friends who commented on each other’s poems, a shift which evolved over a long period. I dedicated my first collection, Dandelions for Mother’s Day (Stride 1988) to him in recognition of my debt to him. before I can touch you. I have to ask where you are. to squiggle on to a high stool. a new man. We’ve plans for you. You say it’s kind of me to come. Whether one subscribes to the notion of poet as a title conferred, as Matt did, or sees it purely as meaning someone who writes poems, what Matt said to me on that visit was a great gift, and I know he did it deliberately. I read it as giving me that long-withheld title, out of love and respect, of passing the baton to me, of telling me to go forward with my poetry despite him not being there to critique and encourage me, as he always had done, his way of saying I was a fully-fledged poet, which indeed he had said in a review but not to my face. And it is why I now feel able to call myself a poet. Today is our 35 and a half year’s wedding anniversary. I very rarely write poems about this aspect o m life, because such poems are difficult. Real love begins where romance ends No-one can can live with the chemical madness of the first flush of love. Real enduring love is in the small gifts of kindness we give each other every day. Nonetheless, this is the one day of the year when we can remember that weird and fantastical phase of falling in love. I want share this little poem from my Salt collection I Sing of Bricks which came out just over a year ago. I wrote it because I had a beautiful pair of gloves, but then I lost one of them. What could be a sadder symbol than a single glove? 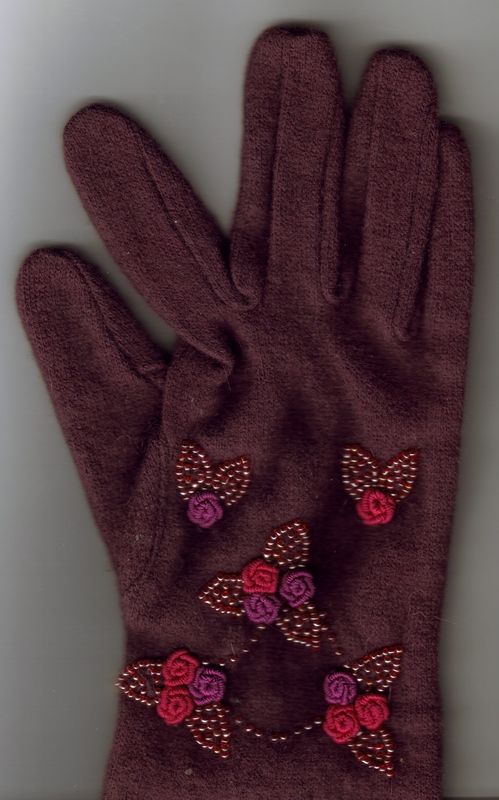 Add this to the fact it was plum coloured and embroidered with beads and roses, and you will see why it’s a good subject for a little valentine conceit poem. reach for you in the night. .
Reading Angela Topping’s poetry, I’m reminded of Robert Frost: not always in the way she writes, but because what she writes demonstrates how she thinks. Like Frost, Topping rejects – seemingly by default – what we tend to call “wilful obscurity”. “No tears in the writer,” said Frost, “no tears in the reader. No surprise for the writer, no surprise for the reader.” There are a few relatively experimental pieces here (‘Johari Whispers’ is one) but more often than not, those tears come from immediately recognisable experiences not obscured by intellectual tricks (‘Coping’, ‘Bypass’, ‘Hospital Visiting’). Those surprises come in language which hits us immediately with an epiphany which, however clever, is relentlessly generous and welcoming. There is no sense that Topping is writing just for fellow writers who ‘get’ this stuff. That’s not to say the poems are superficial. Like Frost, the clarity of the language – that initial spark – ignites a fire in our imagination which lasts long after our first reading; a poem tempts us back time and again (I’m hesitant to say ‘demands’, but only because Topping wants to inspire, delight, not to prescribe or instruct). 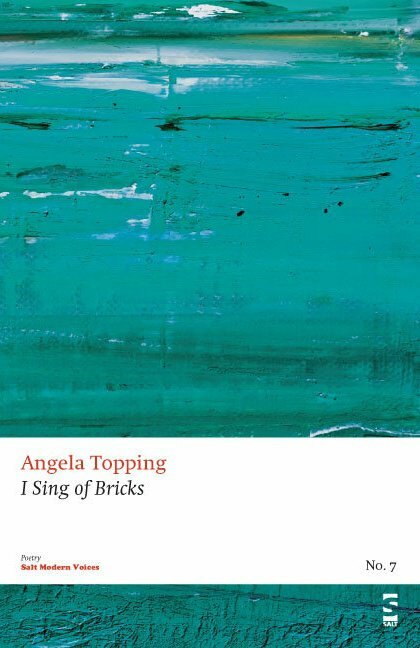 The title poem ‘I Sing of Bricks’ juxtaposes something religious, devotional, magnificent (singing) with something mundane and unremarkable (bricks). Its title is an apt one for the pamphlet, which is very often about seeing old, stale things afresh: shoes, a glove, grass, snowdrops (‘Each Blade Singly’ and ‘Three Ways of Snowdrops’ are among my favourite titles here). Topping’s writing is clever, but cleverness is never made a virtue for its own sake; it’s always a means to an end, which is to reach the heart. In ‘How To Capture a Poem’, the poem is made into an unseen, elusive entity which constantly evades capture; wriggles from our grasp whenever we try to pin it down. Topping understands that none of us has a monopoly on what a poem is or should be, does or should do. Among Topping’s other books and pamphlets is her debut children’s collection The New Generation. Reading this pamphlet, I wonder how blurred the boundaries are – or should be – between ‘children’s’ and ‘adult’. Of course, clarity and immediacy are expected in the former, but Topping reminds us that in fact, they’re hardly an enemy of intelligence or depth in all poetry. Frost isn’t trying to make us scratch our heads in ‘Walking By Woods on a Snowy Evening’. He wants to surprise us, delight us, fill us with curiosity about everything being left unsaid in the scene he describes. For the reader, the delight is in becoming like a child ourselves, full of so many questions that we’re bursting. If the poems in I Sing Of Bricks aren’t wilfully obscure, they’re certainly wilfully determined: to sit among poems like Frost’s, which reach the intellect, but only as a rest-stop on their way towards the heart. Poetically speaking, Topping has taken that road not travelled often enough. So, whether you love poetry already, or wouldn’t normally touch it with a barge pole, that makes her very worth reading. bringing out the greys and reds. with elegant stitchery in earth tones. you engage with the previous courses. servants, solid as hearth and home.